One thing that all us need know is that the project power requirements not only besides on efficiency and quality. Efficiency and quality are subjective terms and you (like me) break and open some market products, you’ll found some really dirty way to power up a electronic device. Well, with that in mind I’m working in power my Samsung Infrared Decoder with a transformerless power supply. Transformerless Power Supplies, instead of use regular transformer-rectifier circuit or switched power circuitry, use direct coupling of AC line to passive components, like resistors and capacitors, to obtain a desired voltage. Yes, it’s a very dangerous idea, but you can control it and minimize risks too. These steps doesn’t require more that 20mA (aprox), and most market components are cheaper. But if you want to really make this cheaper and smaller, a transformer/wall adapter supply it’s a big monster. 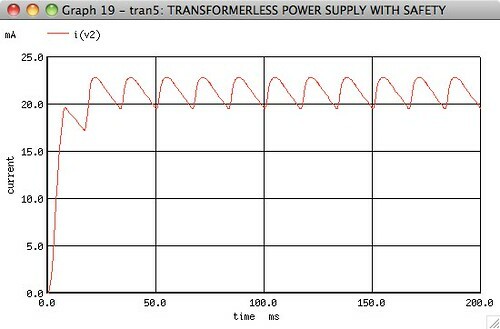 The bad news is that transformerless power supplies, not only are dangerous but less current capable of other supplies. If you need more than a few mA, your circuit will be exposed to a great risk. I’ve chosen values to meet approximately 5V@20mA. The RMS voltage value in Brazil is 127V. The frequency is 60Hz. The zener used have 5.1V drop across. The next step is test a real circuit with real load. So long I’ve news, I’ll post them here. 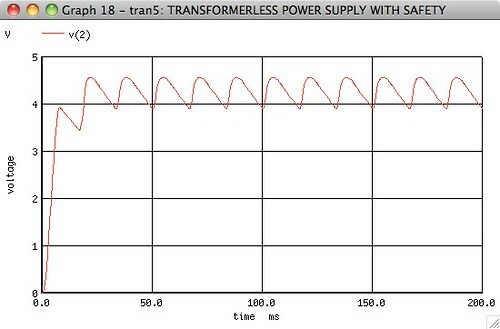 Remember again that transformerless power supplies are naturally unsafety. After decide make that circuit, and finish it, you have in your hands live AC voltage very close to low power electronics, with is a great danger. Stay as advised.